In order to transfer valuable waste materials into reusable materials, that can be reused as secondary raw materials, perfectly functioning, robust size reduction technology with specified material preparation and designed for continuous operation is needed. Find manufacturers of size reduction systems in our Equipment Guide. Stedman Machine Company offers a wide equipment range for selecting the most cost-effective size reduction method: Cage Mills, Horizontal & Vertical Shaft Impactors, Hammer Mills, Lump Breakers, & Air Swept Fine Grinders. Full-scale testing & toll processing facility. Complete size reduction plant design and construction. 24-hr parts & service. HSM baling presses compress packaging waste up to 95 % and compact cardboard, plastics and nearly all waste materials into bales. Regardless of the material to be processed, the volume or the local conditions – HSM has the right product for you. In addition to quality baling presses ”Made in Germany“, HSM also offers full customer service. 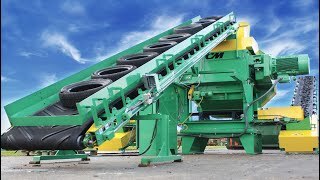 C&G Scrap processing Machines and Solutions S.R.L. CRAM-A-LOT / J.V. Manufacturing, Inc.